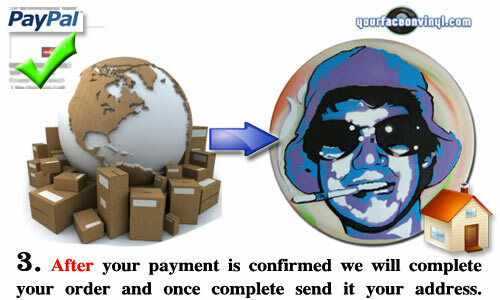 We want to make ordering authentic hand-made custom portrait stencil art as simple as possible. Even though the actual process of creating your stencil art portrait piece is not. We allow you to have the option to be involved as little or as much as you want in the creative process. After you successfully place your order either through our online store* or via a personal message request* we will respond to you within 24 hours with an automated message. This message will explain what kind of photos you should send us along with questions regarding the styling of your order. This includes what colours you would like to use, what kind of lacquer finish you require and all the other important information we need to create your authentic stencil gift art order. We want to be clear about your requirements for painting the perfect stencil art for you! Once we have received all the necessary info we will create an artwork preview (or multiple computer generated previews) for you to choose and confirm from. These are sent to you within 48 hours of receiving your order information and photographs from the previous step and sent to you along with a personal confirmation message from our stencil artists. You will also receive contact telephone number, Skype, postal address and invoice, all communication from here is direct with the artist. NOTE: If you decided to order through personal message we will ask for payment confirmation at this stage. This is true for all art gift sizes that are not available for purchase on the online store. From the moment you confirm size, style, colour and all details related to your artwork preview we usually estimate a 2 week or less delivery period to your door step as mentioned in our price guide and online store. You can contact our artists at any point to check the status of your artwork. However remember to indicate if you require speedy processing option which is in the e-mail we will send to you following your initial order. Check the below video to give you an idea of the order and painting process at your face on vinyl, in this example a customer ordered a stencil on vinyl record portrait of Albert Einstein as a gift for his girlfriend. You can see in the video the process of design and spray painting the separate layers onto vinyl 12″ record. The order was completed and delivered within a 2 week period. From initial receipt of photo to delivery of finish portrait stencil artwork, our stencil artists are with you every step of the way. In this video you can see the initial photo we used to create the artwork, the digital preview we e-mailed to the customer and the final painting process of the multi-layered stencil portrait artwork. Not shown in the video is the final lacquering process where we added a protective layer of high-protection gloss lacquer to seal the artwork into the the vinyl and make it resistant to knocks and scratches. Obviously it’s still art and therefore should be handled with care! 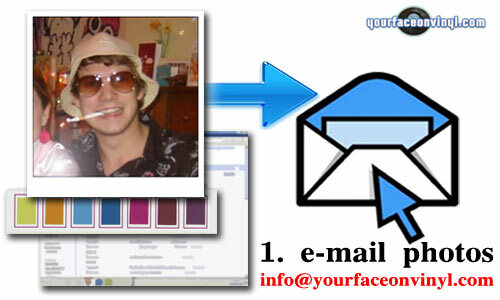 Your face on vinyl is a professional company; however there may be times when resources are limited. We are a handful of artists that understand the nature of the creation process and how to actually create the perfect artwork. To avoid disappointment make sure you order way in advance! Especially during busy periods such as festive holidays and public holiday periods. We say this because we understand how crucial it is to give a gift or present on the day itself not the day after or day before. 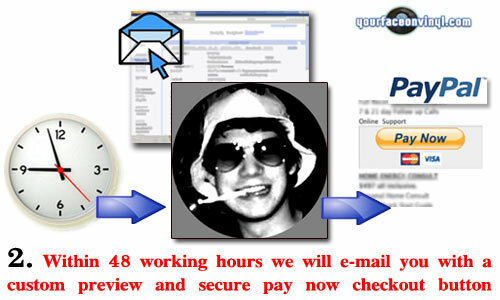 We will do everything possible make sure you order is processed quickly and swiftly.